Matt Moon has a super neato in-studio interview today (Thurs. 7-8pm). 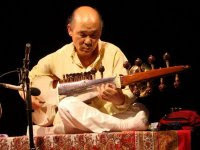 Steve Oda was a student of the legendary Maestro Ali Akbar Khan for more than 35 years before his guru’s passing last year. Khan and Ravi Shankar were the men primarily responsible for bringing India’s rich musical traditions from East to West. Oda plays the sarod, a 25-string instrument that is arguably the most beautiful lute in the world. In Persian, the word sarod translates to “beautiful sound.” The deeply emotive and highly expressive sounds of the sarod make it among the most pleasant instruments to listen to, even if you know nothing about Indian music. It is considered one of the most challenging instruments to master, but in the hands of a guru like Oda, the sarod is capable of transporting the listener to a higher place.